If you were looking for a British town or city that was trying to emulate Hannover in Germany, I doubt very much that Weston-super-Mare is the location that would spring to mind. Hannover is the home of an extraordinary series of artistic bus shelters, which we looked at a year ago. That level of artistic input into bus/tram shelter design is virtually unheard of anywhere in the world (hence the write-up) and certainly nowhere in Britain has ever come close to replicating it. You might think that the most likely British locations for finding anything similar would be London (but its current crop of bus shelters are quite devoid of glamour, I’m afraid) or one of the cities which is famously pro-bus like Brighton and Hove or Oxford. But here again you’d draw a blank. Thanks to contracts with on-street bus shelter advertising companies who have little incentive to come up with interesting bus shelter designs, most towns and cities in Britain have little in the way of attractive bus shelters, except for heritage shelters designed for trams during a more stylish age. Instead, it’s been left to Weston-super-Mare, a somewhat faded Victorian seaside resort in the south-west of England, to come up with something that can stand alongside Hannover’s programme. 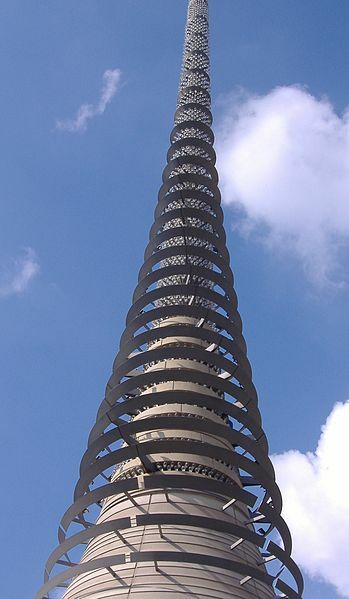 Standing 30m tall by the time it reaches the tip of its slender spire, it is the work of Wolfgang and Heron, a partnership of artists Wolfgang Buttress and Fiona Heron. The lead artist on the project was Buttress, who has designed various other public artworks around the world, and who is working on the dramatic UK pavilion for the Milan 2015 Expo. Silica, which was installed in 2006, represents the maritime locale of Weston-super-Mare by embodying the ideas of sand, water and light. It is faced in glass reinforced concrete, with a texture and colour reminiscent of sand, while its overall shape can be read as that of a water droplet. Though some locals believe it is reminiscent of a vegetable, as you’ll read later, if it resembles anything else (in shape if not in scale) then it’s probably Ještěd Tower, a television transmitter tower in the Czech Republic. Silica features some 6,000 cast glass prisms containing LEDs (which cost less to run to than a couple of table lamps, so efficient is the technology). During the day, the prisms housing the LEDs catch the daylight and at night the LEDs give a colour-changing display. A band of LEDs towards the bottom displays text-based messages and public information both day and night. Silica stands on Big Lamp Corner, a road junction in Weston-super-Mare named for a large street lamp which used to occupy on the site. I find the idea of a populace so astounded by public street lighting that they name part of town after it to be rather wonderful, and Silica’s lights pay homage to its illustrious predecessor. It’s fair to say that Weston-super-Mare hasn’t had the easiest time of it since the middle of the 20th century, since British holidaymakers deserted its wide sandy beach in favour of cheap holidays abroad. 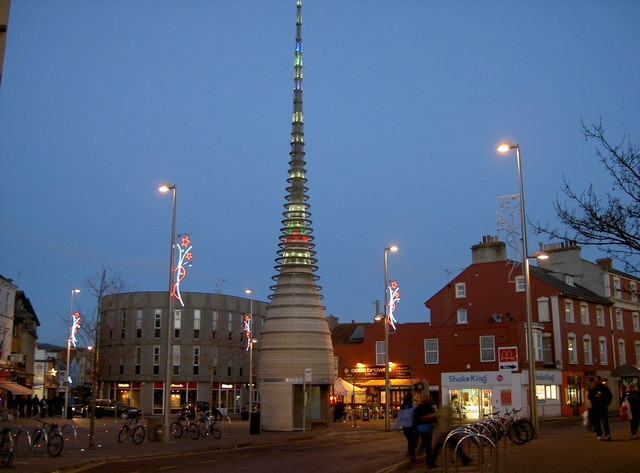 An £11m Civic Pride Initiative, funded by a variety of local public bodies such as the South West Regional Development Agency, brought monies to Weston-super-Mare during the mid 2000s for a range of initiatives designed to make the town more attractive to investors, visitors and residents. Silica’s £280,000 cost was a tiny part of that overall project. Needless to say, because this is Britain after all, Silica hasn’t been entirely welcomed. Some locals have dubbed it “the carrot” because of its presumed likeness to the vegetable (surely a parsnip would have been more accurate given its colour?). They can be found moaning about its cost/appearance/usefulness from time to time (see here, for instance). This tells you a lot about the strong streak of philistinism that a large number of British people like to display as a form of inverse snobbery, not to mention their ignorance of the detail of common vegetables. British people are profoundly uncomfortable about spending public money on artworks, though occasionally they will take one to their hearts, and conveniently forget that many of them moaned about the waste of money before it was installed (like sculptor Antony Gormley’s Angel of North in Gateshead). Silica doesn’t yet seem to have reached this level of acceptance, and that has made it difficult for the local council to spend the money necessary on its maintenance. Seaside environments are tough on any built structure thanks to salt-laden, high moisture content air, and high winds. After a few years, Silica needed a wash and brush up to keep it looking tidy (see here), but the local council seemed to drag its feet about spending the money. That’s a real shame. 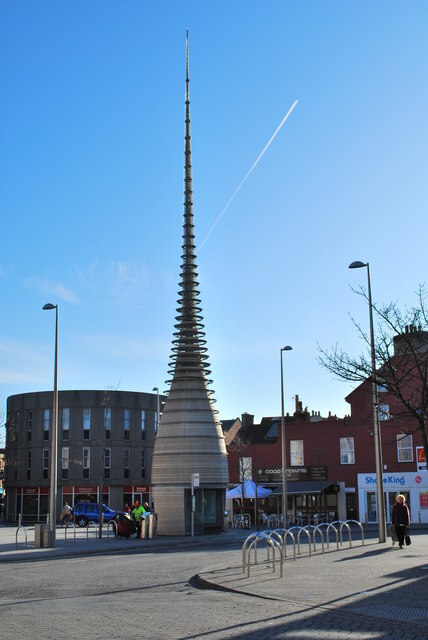 I don’t think the people of Weston-super-Mare realise quite how unusual it is to have a landmark piece of art in which they can wait for their buses, rather than the dreary, draughty glass and metal bus shelters that plenty of larger and better-off towns offer their bus users. To judge by the number of photos you can find of Silica on the internet, and the media coverage it has generated, it’s doing a great job in promoting Weston-super-Mare, which is more than can be said for bus shelters in most other British towns and cities. …and as ever, anything linked to in the text above will have been read as background for the writing of this article. It is an interesting building -I am sure that those who have attached the label of ‘Paddy’s Wigwam’ to the Metropolitan Cathedral in Liverpool would have a suitable name for it. Perhaps ‘a nosedived Zebedee’ from Magic Roundabout might fit the bill – a character from the cult children’s series in ye good olde days. we have just visited Weston Super Mare and thought Silica was an excellent addition to the town, quite a talking point , well done Weston.